Has Trump Already Lost Nevada? The early vote and polls in Nevada continue to disagree. The polls suggest a tight race between Hillary Clinton and Donald Trump. Meanwhile, Democrats, thanks in large part to high turnout on the last day of early voting on Friday, have built a large lead in early voting in the state.1 But what exactly does Clinton’s early-vote advantage in Nevada tell us? And if Clinton does win the state, how does it affect her chances in the Electoral College overall? If Clinton and Trump win an equal share of their respective party’s voters, it will be difficult for Trump to win the state. Still, we should be careful. The early vote numbers don’t guarantee the polls are wrong. Being a registered Democrat doesn’t necessarily mean you’re going to vote for Clinton. If Trump is winning more registered Democrats than Clinton is registered Republicans, the early vote data in Nevada may not mean what we think it means. Indeed, some Nevada polls (though not all) show Trump getting a higher percentage of self-identified Democrats than Clinton gets Republicans. It’s also possible that Republicans turnout in disproportionately strong numbers on Election Day, despite previous trends. But let’s say the polls are wrong in Nevada, and, as Nevada political reporter Jon Ralston put it, Trump “needs a miracle in Vegas on Election Day — and a Buffalo Bills Super Bowl championship is more likely” to win the state. How much of a difference would that make to Clinton’s chances of winning the White House? Well, it depends on whether the polls are underestimating Clinton only in Nevada or whether there’s a more systemic problem. Let’s say the error in Nevada was more specific to Nevada (i.e., because pollsters there have a tough time reaching Latino voters). In 2010, for instance, most pre-election surveys underestimated how well Democratic Sen. Harry Reid was going to do. Even as Reid won re-election, many Democrats nationwide lost. If the error is only in Nevada, it helps Clinton but not by much. In 2.6 percent of our model’s simulations, Nevada goes to Trump and Clinton loses the Electoral College but would have won it if she had won Nevada. So if we give Clinton Nevada, her chances of winning the Electoral College increase from 65.5 percent to 68.1 percent. That’s not nothing, but it’s not much, either. This map allows Clinton to win without Florida or North Carolina, where the polls are close. Trump, however, has managed to narrow the margin in New Hampshire to a few percentage points. 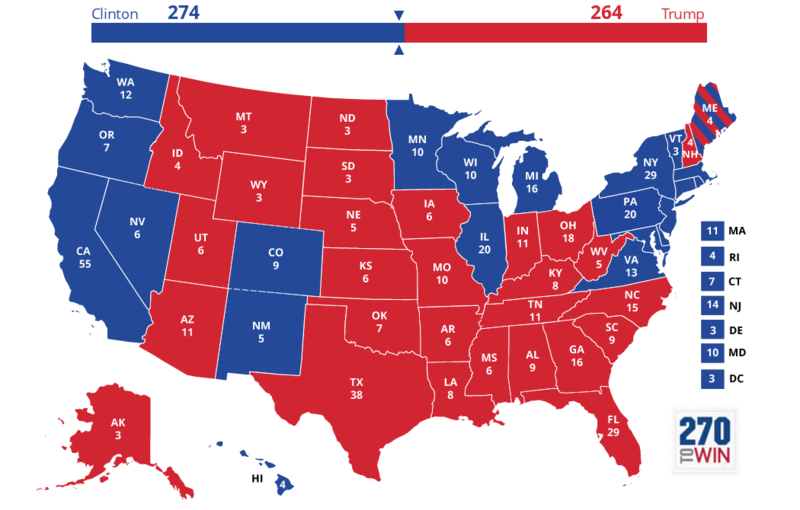 Without New Hampshire and its four electoral votes, Clinton falls back below 270 electoral votes on this map. Clinton can, though, substitute in Nevada and its six electoral votes for New Hampshire. In all the blue states above besides Nevada, Clinton holds a lead of at least 3 percentage points in the polls. Remember, though, it’s possible that the polls could be off by that much in a relatively close state such as Michigan or Pennsylvania in the other direction. That’s why a polling miss in Nevada is far more significant if it means the polls are off in other states in the same direction. In 2012, the polls underestimated Obama in Nevada and all over the map. That led to an easy Obama victory, despite pre-election polls pointing to a close race. In the FiveThirtyEight polls-only forecast, which assumes that if one state’s polls miss then a polling error in that direction is more likely to occur in other states too, Clinton wins 88 percent of the time with a victory in Nevada. That’s obviously a big difference and why the early vote numbers coming out of Nevada could mean a lot. For now, though, we don’t really know what the early vote in Nevada portends for Clinton nationally. It’s certainly not evidence that this election is over. It is, however, a potentially good sign for Clinton. This includes absentee voting as well.